One of the impressive things we've noticed at boat shows recently has been the amount of companies that offer training for boaters. These companies recognize that safe boating courses (required in many states and Canada) are a great start, but nothing compares to the experience you get behind the "wheel" of an actual boat. The growth in the number of companies offering on-the-water, hands-on boating education is a very promising step towards improving boating safety. One might ask, "isn’t a boating safety certificate enough?" While this analogy has surely been made before, imagine being handed a drivers license after only passing a written driving test… without anybody checking to see if you know how to do a K-turn or parallel park (Okay, most of us still have trouble with these two maneuvers, but you get the idea). Many boaters buy a boat, get a certificate, and then rely on the kindness of others for a hand in going out for the first time. That's great, but it's not "training". There's a real need for boating education for new boaters outside the classroom, and that's where companies such as Sea Sense come in. For more than 20 years Sea Sense has always focused on learning while doing. Sea Sense is also unique in that they primarily provide training to women and couples – a focus that was lacking in the industry. This year, Sea Sense is offering single-engine trawler training on Chesapeake Bay from Annapolis, MD. The new programs include scheduled classes for women as well as customized instructional charters for couples, families, and groups. If that's not convenient for you, but you still want to train with Sea Sense, you're in luck. Sea Sense also offers training year-round, all over the world. While most sessions are held near their home port in Florida, there are also opportunities for on the water training in places such as the Pacific Northwest, New England and around the Great Lakes. 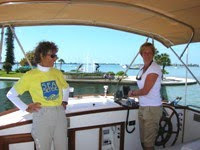 Outside the US, Sea Sense is offering a ladies-only boating course in Ireland this year according to asktheboater.com. Sea Sense even makes house calls - they will come to you for training on your own boat.